Christmas paintball vouchers – the ideal present! 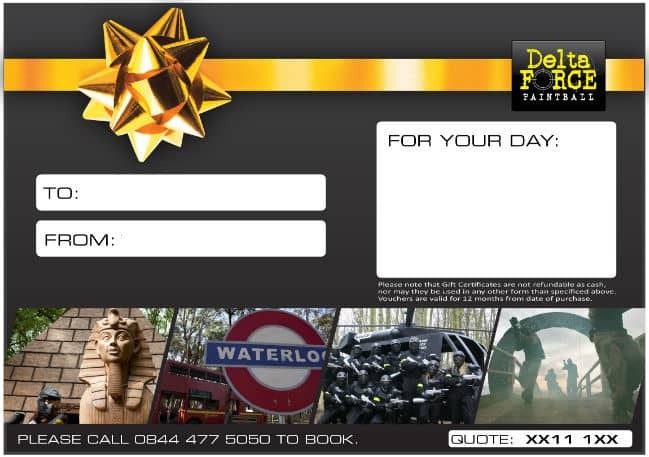 Delta Force paintball gift vouchers are the ideal Christmas present for friends and family! For your friends or family members who have everything, a paintball voucher is a fun and exciting present that they’ll be sure to remember for years to come. Paintball gift vouchers are available to purchase right up until Christmas Eve – we can arrange for your gift voucher to be emailed to you for free, or for a small fee we can send you a laminated voucher in the post. Should you choose the post option, we recommend ordering your voucher the week before Christmas to ensure it arrives in time. Paintball vouchers can be tailored to suit the lucky recipient – in addition to entrance and equipment hire for full day events, you can order extra paintballs and a hot lunch to get the players through the day. If it’s an adult you’re buying for, you can even add paintball pyrotechnics to make their experience go off with a bang. Paintball vouchers can be arranged for one individual or a group – so if it’s difficult to find a gift to suit the whole family, you can arrange a group paintball voucher for everyone to enjoy. If you would like to arrange a paintball gift voucher for Christmas, please call our booking office on 0844 477 5050 and a member of staff will be happy to assist you.